LAS VEGAS -- Daniel Cormier beat one of the greatest fighters of all time at UFC 200, though it was not the night he or the fans envisioned. Cormier (18-1) defeated the great Anderson Silva via unanimous decision Saturday at T-Mobile Arena. Cormier took Silva down in all three rounds of their nontitle light heavyweight fight. Judges awarded Cormier with unanimous 30-26 scores. Of course, Cormier was supposed to defend his 205-pound championship against interim champion Jon Jones in the main event, but that matchup was canceled when Jones was informed of a potential doping violation Wednesday. Silva, 41, replaced Jones on two days' notice. The Las Vegas crowd booed Cormier's game plan of taking Silva to the floor. Afterward, Cormier said the strategy was necessary. "I've been training for a specific guy for eight weeks," said Cormier, who trains out of American Kickboxing Academy. "The guy falls out of competition. I was a little nervous. He's so good, I did what I had to do. It's tough to switch opponents. The guy's the greatest fighter we've ever seen in the Octagon. I can't complain. I did what I had to do." Silva (33-8) was only two months removed from a surgical procedure to remove his gallbladder. UFC president Dana White praised him afterward for taking the fight on short notice. "He went in and fought the light heavyweight champion of the world," White said on SportsCenter after UFC 200. "People love Anderson, man. What he did this weekend reminded everybody of why he was the great champion he was. Everybody respected him tonight and gave him love." Silva didn't put up much of a fight early, giving up a single-leg takedown on Cormier's first attempt. The rest of the round essentially consisted of Silva trying to tie Cormier up from the bottom. A nice right hand by Cormier early in the second round appeared to wake up Silva a little. He jumped into a knee strike, which drew a smile from Cormier. Moments later, Cormier caught a body kick and took Silva down, which drew boos from the crowd. Referee John McCarthy helped Silva out with two stand-ups -- one in the second and one in the third. It was clear that Silva had no shot at getting back to his feet on his own against Cormier, an Olympic-level wrestler and former heavyweight. In the third round, Silva flirted with what would have been one of the most shocking comebacks in UFC history, hitting Cormier with a stiff left kick to the body that had him visibly wincing. Silva went after Cormier with another jumping knee, which opened the door for Cormier to grab on and tie Silva up in a clinch until the end of the fight. Silva, who hasn't recorded a win since October 2012, did not appear upset with the result. "This fight was a big personal challenge for me," Silva said through an interpreter, "to accept it and come in here and put into practice all I've done throughout the years." Cormier, 37, remains the undisputed light heavyweight champion. He has defended the title once, via split decision against Alexander Gustafsson in October. A contenders' bout between Anthony Johnson and Glover Teixeira at UFC 202 on Aug. 20 could determine Cormier's next opponent. Jones, meanwhile, is facing a potential two-year suspension. Dana White can't say enough good things about Anderson Silva, who despite not winning against Daniel Cormier was still one of the heroes of the night for filling in at the last minute. 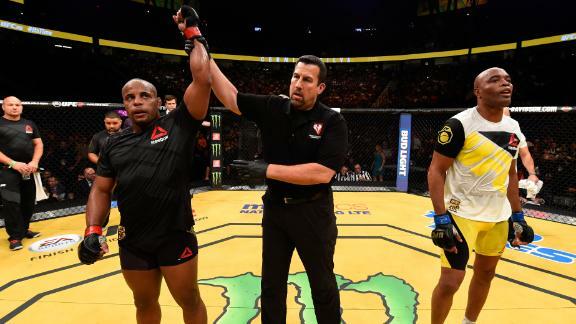 Daniel Cormier secures takedowns in all three rounds en route to an unanimous decision victory over Anderson Silva at UFC 200, who took the fight on short notice to replace Jon Jones.